Is your business innovative in nature? Do you invest in engineering, design, software or other tech activities as part of your delivery? Would you like to learn how to obtain and maximise the available HMRC tax relief which could be as high as £26 for every £100 you spend on innovating? 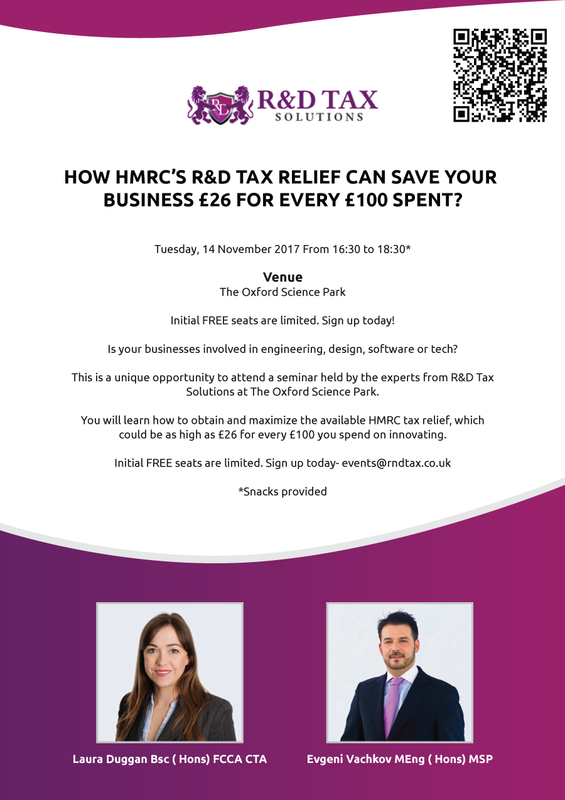 R&D Tax Solutions, a specialist tax consultancy based in Manchester, will be hosting a free seminar at The Oxford Science Park on Tuesday 14 November 2017 from 1630 to 1830. They will share a number of strategies and tactics to help businesses to maximize the available tax relief on offer from HMRC. You will understand the outline of the HMRC tax credits scheme, know whether your business is eligible for the R&D credits element and understand how to access the support and assistance you may need to submit a claim. R&D Tax Solutions have expertise in the creation and fulfillment of Research and Development tax relief claims. Their firm is led by Laura Duggan and Evgeni Vachkov, with the support of highly experienced and qualified tax consultants. See further information about R&D Tax Solutions. Sign up today for your free seat through Eventbrite or by emailing events@rndtax.co.uk, or contact 0161 298 1010.